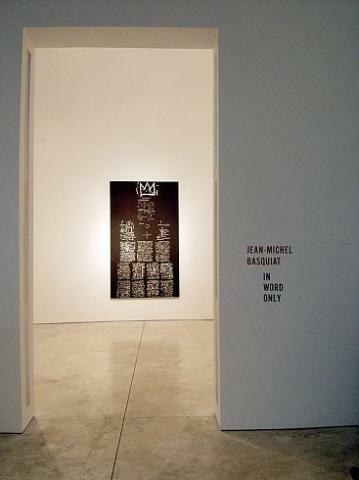 Cheim & Read is pleased to announce an exhibition of the work of Jean-Michel Basquiat, "IN WORD ONLY." The exhibition presents paintings, drawings, and notebooks that feature only Basquiat's written words. The artist is well know for large, colorful works dense with gesture, collage, figures, symbols, and words; but this exhibition will be the first to exclusively feature Basquiat's unique and significant use of language. The exhibition will include works from the artist's entire career, dating from 1979 to 1988 (the year of his death). A hardbound, color catalogue will accompany the exhibition with an essay by curator Richard Marshall. For Jean-Michel Basquiat, the meaning of a word was not necessarily relevant to its usage because he employed words as abstract objects that can be seen as configurations of straight and curved lines that come together to form a visual pattern. Conversely, the artist also employed words and phrases that are loaded with meaning and reference, in particular those words related to racism, black history, and black musicians and athletes. Basquiat's word paintings and drawings often appear to be a secret, coded language that the artist devised and left for the viewer to attempt to decipher. Basquiat acknowledged his manipulation of words, stating "I cross out words so you will see them more; the fact that they are obscured makes you want to read them." However, Basquiat's casual, random manner is deceptive, because on closer inspection his choice of words often coalesce into intelligent, meaningful, and cohesive thoughts and subjects. The majority of the works in "IN WORD ONLY" have never been exhibited or published. The Estate of Jean-Michel Basquiat has generously lent a number of important paintings and drawings, in addition to several of the artist's unfamiliar notebooks. Basquiat continually wrote and drew in notebooks, and used them as a laboratory for experimentation and personal expression. These rare notebooks offer fascinating insight to the artist's aesthetic. Additional works have been borrowed from private collections in the United States and Europe. JEAN-MICHEL BASQUIAT: IN WORD ONLY coincides with two major retrospective exhibitions of Basquiat's work at the Brooklyn Museum, New York, March 11 – June 5; and the Museo d'Arte Moderna, Lugano, Switzerland, March 19 – June 19, 2005.